Anyway, I thought I would update folks on the tools I find myself using most these days. By design, you will see a lot of sameness here. While focusing on using, I also limited myself so I get a really good feel for the fewer things I am using. 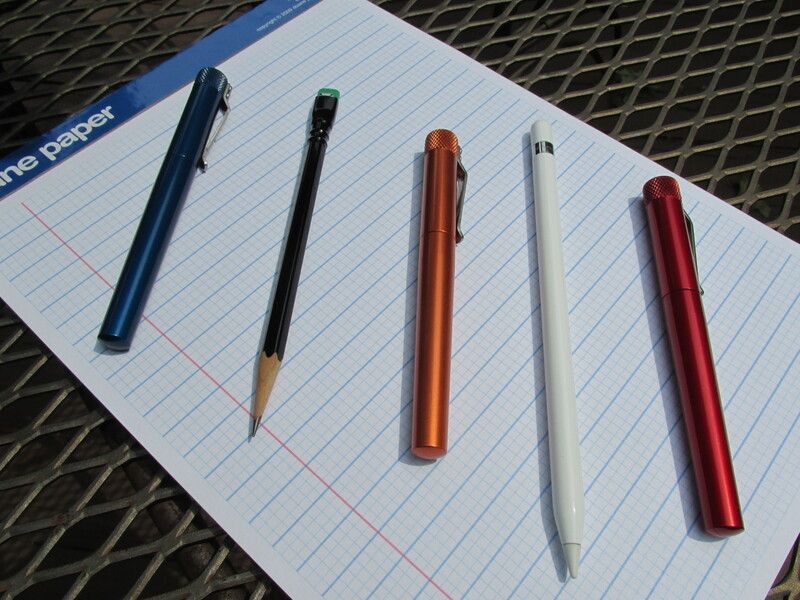 What you see here are the pens, pencils and paper used almost exclusively for the better part of a month. 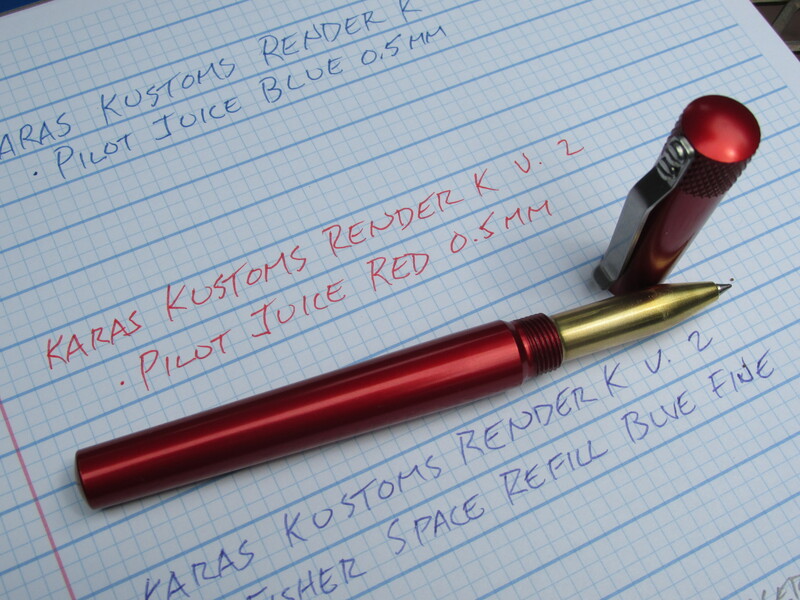 For pens, I used nothing but Karas Kustoms Render K version 2 since they arrived around May 13th. 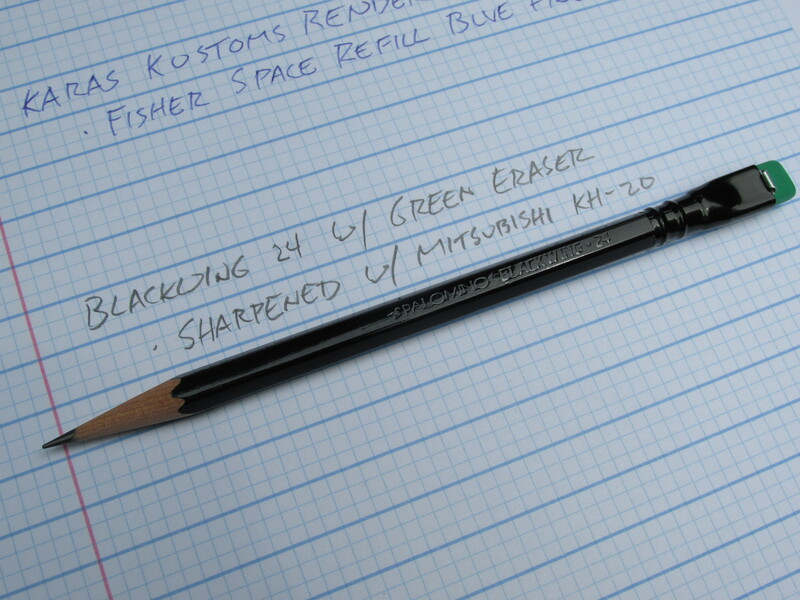 For wood-cased pencils, I’ve used only the Blacking 24 since it came out a few months ago. 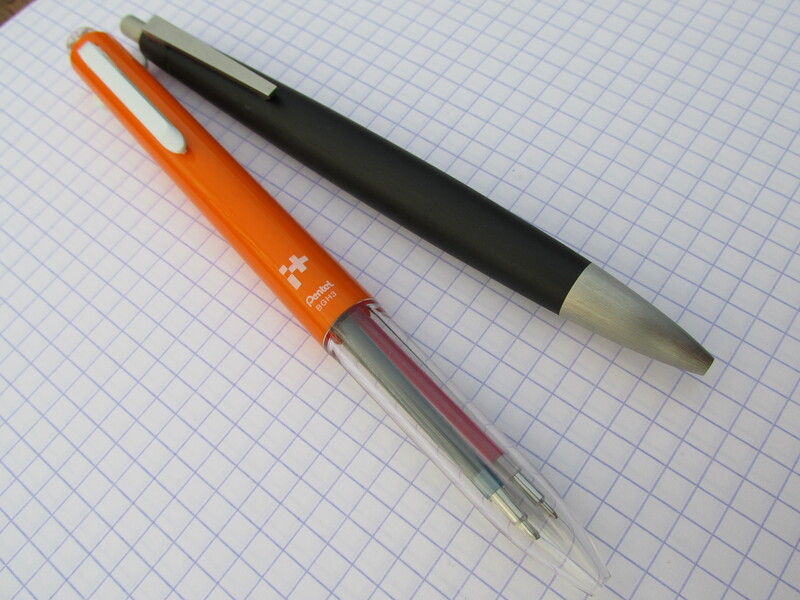 I have not used mechanical pencils all that much recently, but I did recently dig out my Lamy Scribble 0.7 mm. Turns out that thing is totally awesome if you take the clip off. 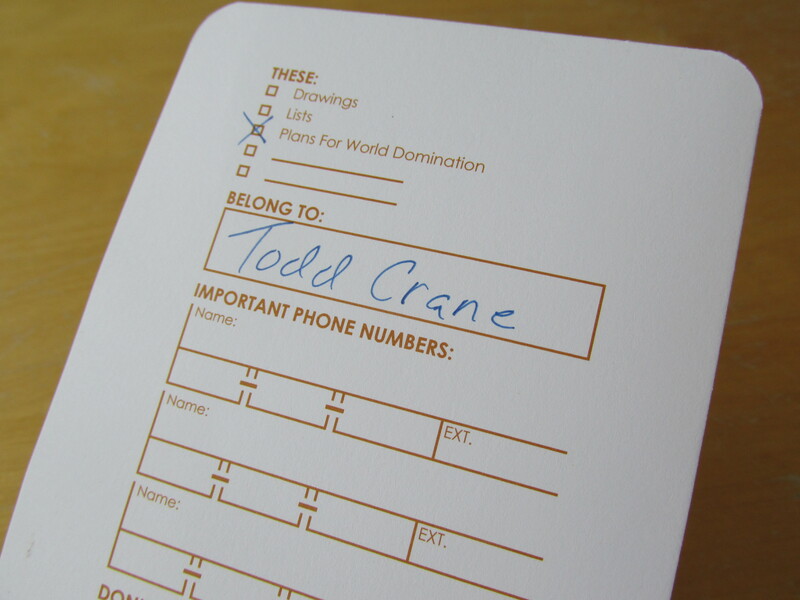 As for paper, I have not written many notes in a pocket notebook (don’t know why – just haven’t), but the Doane Paper pads have seen plenty of action. Without further delay, a few pictures and a few thoughts. 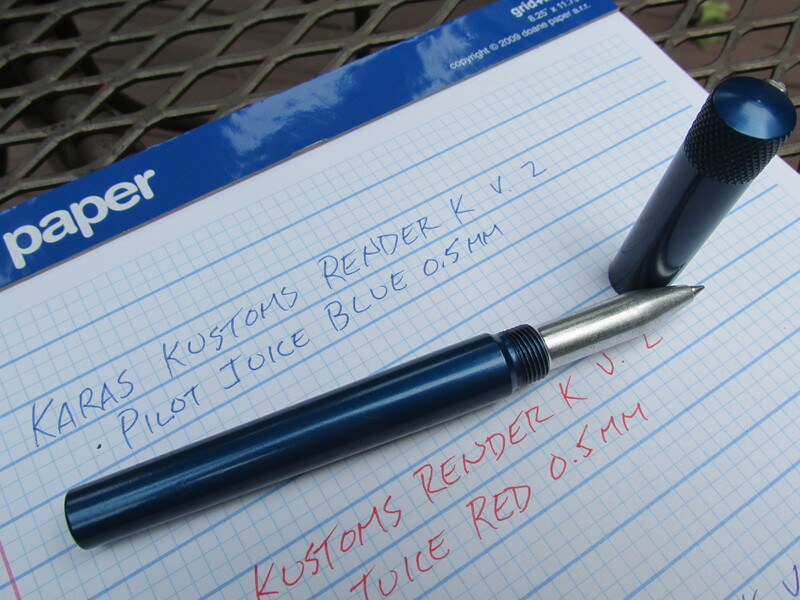 The blue Render K with blue Pilot Juice 0.5 mm has been the go-to workhorse since it arrived in the middle of May. I bought a few different grips (aluminum, tumbled aluminum, black aluminum, brass) to see which combinations I like the best. I found the plain and black aluminum grips a touch slippery compared to either the tumbled aluminum or the brass. 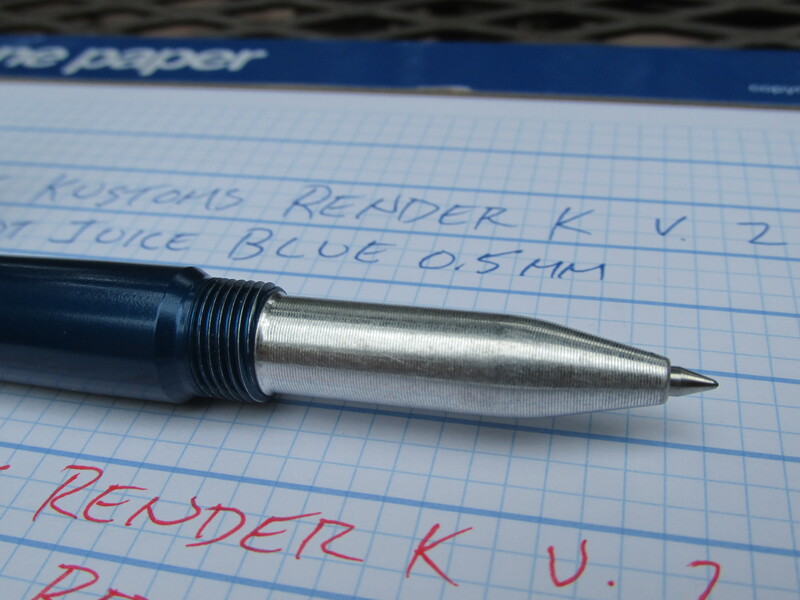 This Render K is shown with the tumbled aluminum grip. 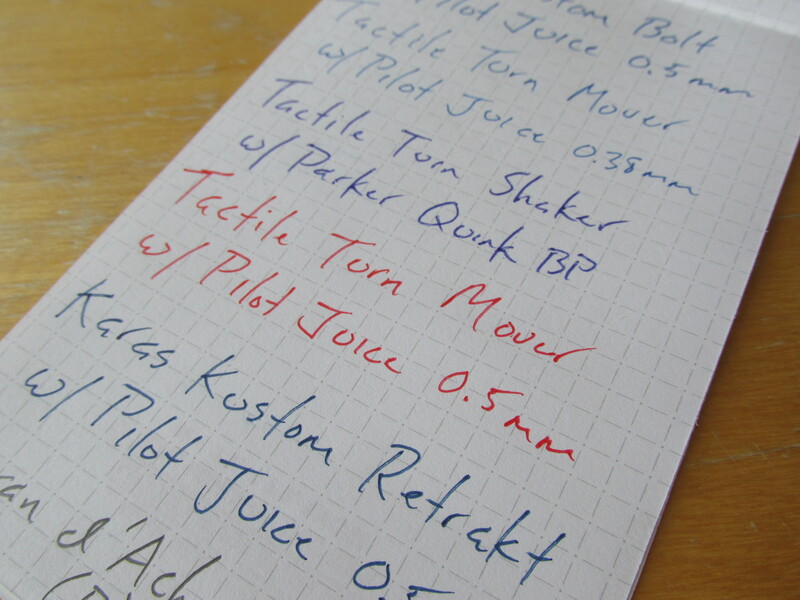 As for refills, I’m not ready to make it official yet but I think I have changed my gel pen allegiance from Pentel Energel 0.7 to Pilot Juice 0.5. 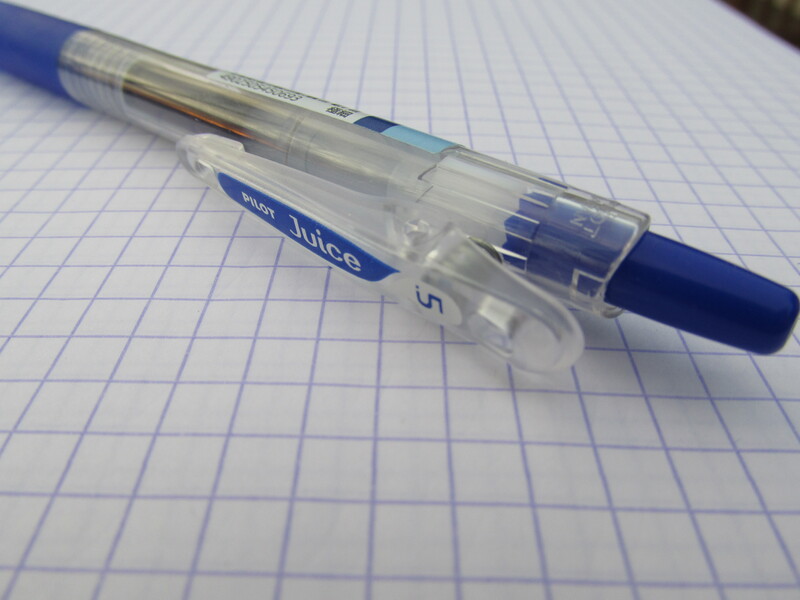 It is not slam dunk by any means however, more often than not, I prefer the tighter lines and slightly less generous ink flow of the Juice 0.5 than the Energel 0.7. What about the Energel 0.5 you ask? For some reason, needle points and my left hand do not always work well. 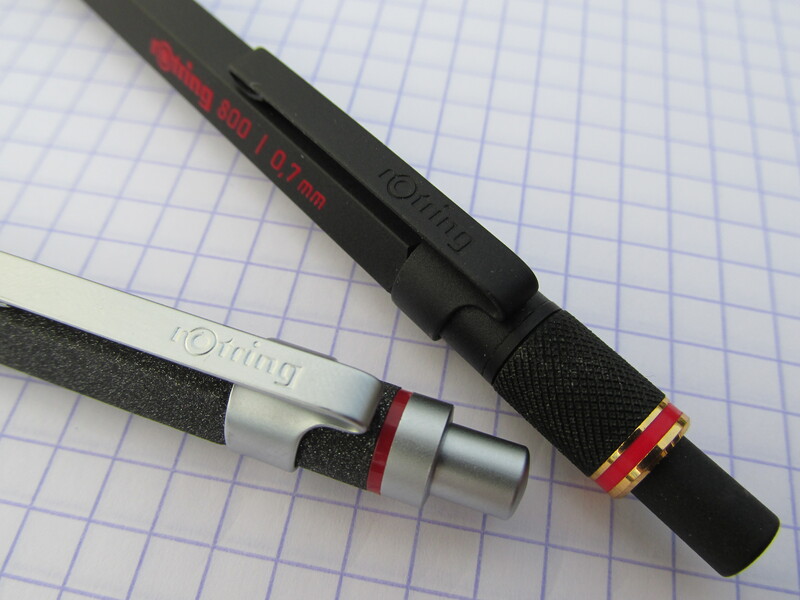 My grading weapon of choice has been this red Render K with the brass grip section and a 0.5 mm red Juice. In bright light, the red Juice leans a touch in the orange direction which I like. Between the brass and tumbled aluminum sections, I prefer the added weight of the brass. The combination of the added weight and whatever goes on between my fingers and brass gives me a better sense of control. I have noticed that all the grip sections gains added character from small dings and scratches imparted by taking the cap on and off. I consider this a cool feature and not an annoying bug. One more Render K, except here we have a ballpoint refill. Most of my ballpoint pens have a Parker Quink refill in them. 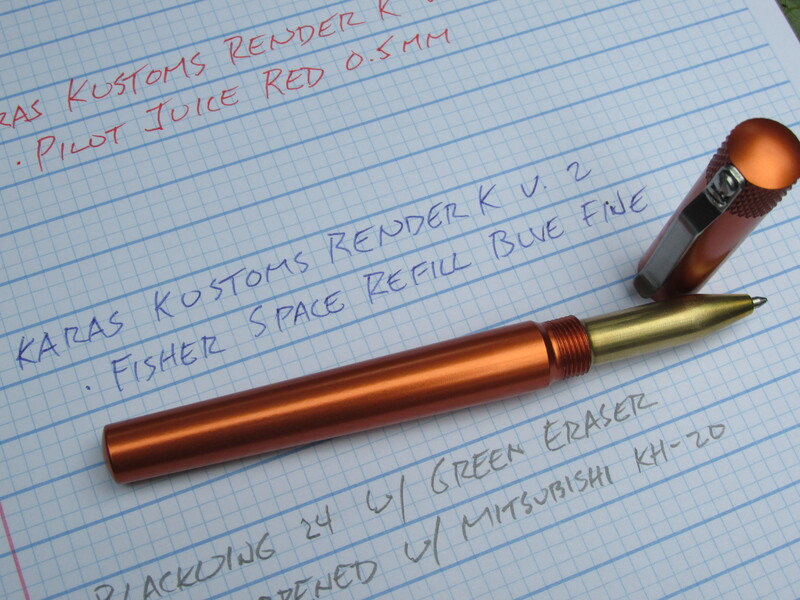 For the Render K, a Fisher Space Pen refill seemed more appropriate. 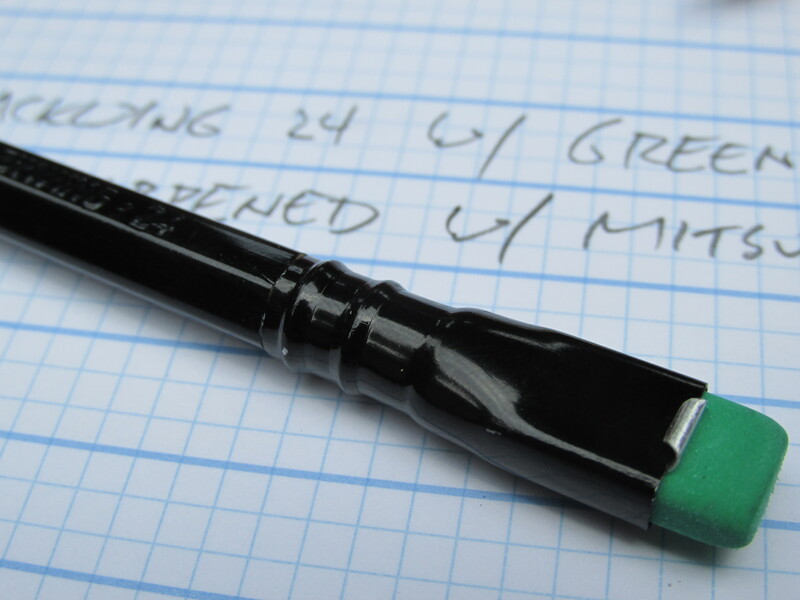 I go back and forth on whether I prefer the fine or medium tip for the Fisher refills. Right now, I’m leaning toward fine which probably has something to do with the fact that I write a lot with the 0.5 mm Juice so the medium Fisher refill seems too wide in comparison. 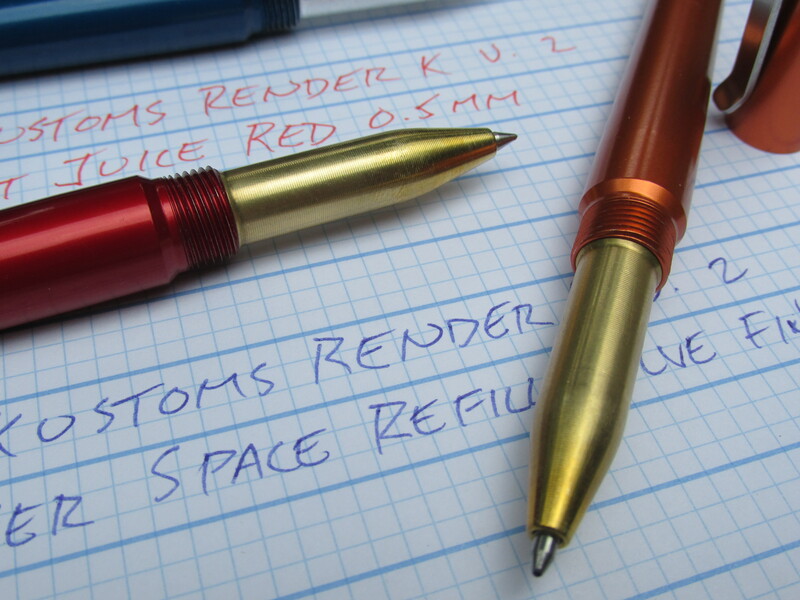 The Render K, Fisher refill and brass grip make a really comfortable combination for me. 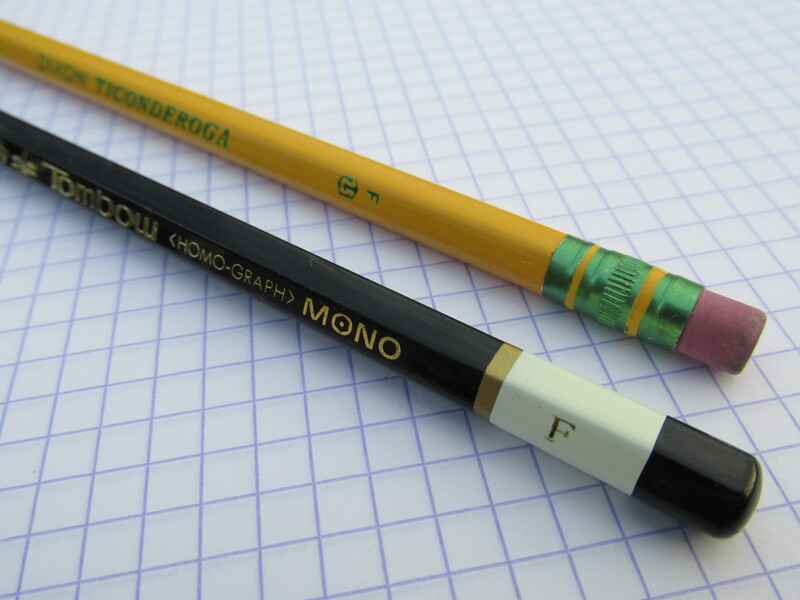 When it comes to wood-cased pencils, I am really down to two choices: Tombow Mono (usually in F) and Palomino Blacking 24. I prefer slightly harder graphite to avoid lefty-induced smudges. I also prefer my pencils to have an eraser. 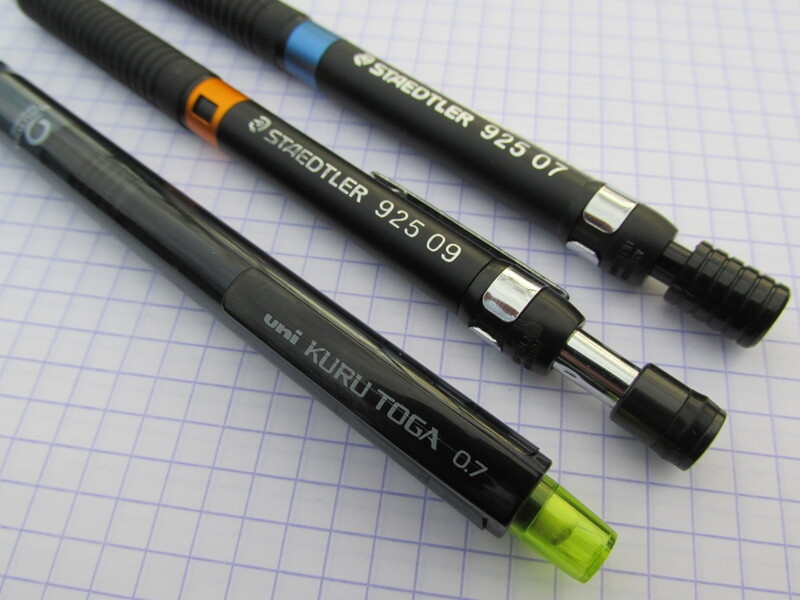 So, when it comes to the graphite, it is slight advantage Mono F. When it comes to having an eraser and the overall look and feel, the advantage goes to the Blacking 24. If I absolutely had to pick one and only one it would be the 24…at least for today. I use an iPad Pro mirrored to an AppleTV when I teach so my Apple Pencil is indispensable. For reading the news and just generally goofing off, I really like using split view on the iPad Pro with Tweetbot on one side and Safari on the other. So there we have it – the stuff I’ve been using lately. Here are some more pictures for you to look at. Q. What do egg shells and paper have in common? A. They are both made of calcium carbonate. At least the “stone” paper from this Kickstarter project is made from the same stuff as egg shells. Nick, the creator of the Da Vinci Notebook, sent me a sample of this interesting paper and I decided to put it through a few paces. The first thing you’ll notice about the stone paper is that it feels very soft and that there is almost no discernible texture to the paper. The phrase “smooth as a baby’s bottom” comes to mind. It also has some heft to it. I cannot find the paper weight in the information that Nick sent me but I’d guess that a single sheet of stone paper weighs about the same as at least 3 sheets of Rhodia. Seems to me that a 100 page, 5″ x 8″ notebook of this stuff would weigh a pound or more. Lastly, in the initial impression category, would be the color. The paper has a flat white color to it. 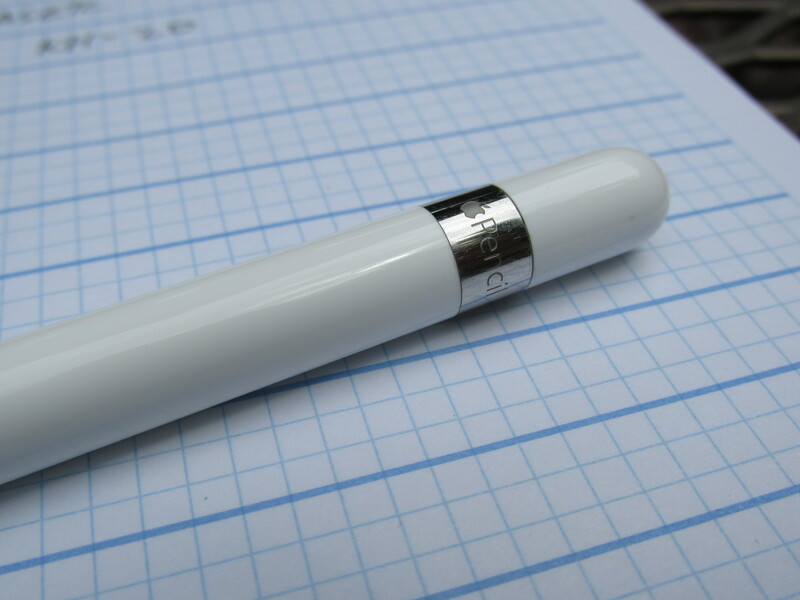 It is not bright white like most copy paper but it is not in the cream color range either. I’d call it flat or off-white or soft white. Whatever name fits the color best, the important point is that it’s easy on the eyes. 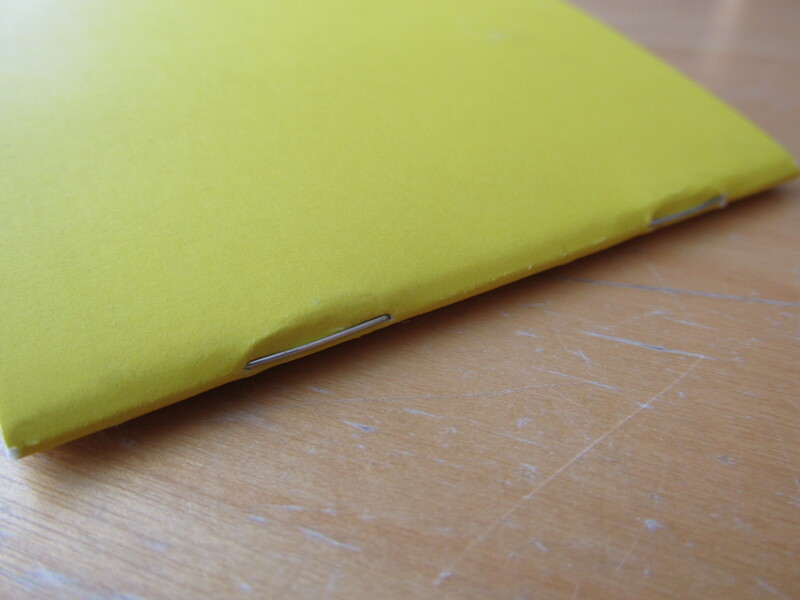 The paper is also described as water and tear resistant. I’d agree that it does have some water repellency, but it didn’t seem to take much more effort to tear than the decent copy paper I have. When it does tear, it seemed to do so neatly without many fibers showing along the tear line. How does the paper perform? Well, it depends. 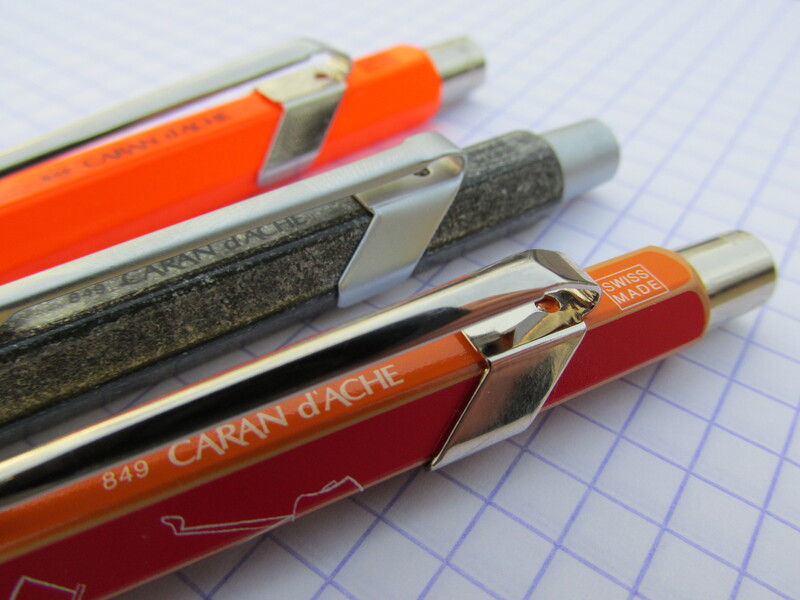 For most pen and ink combinations it performed well and felt smooth. For a couple of pen and ink combinations it was more or less, as the kids might say, epic fail. 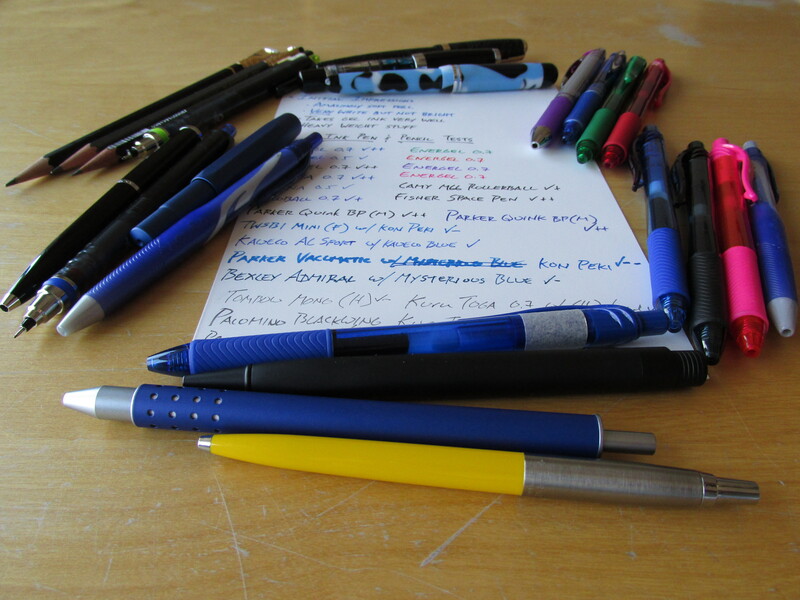 Let’s take a look at pictures of particular pen/ink combinations. 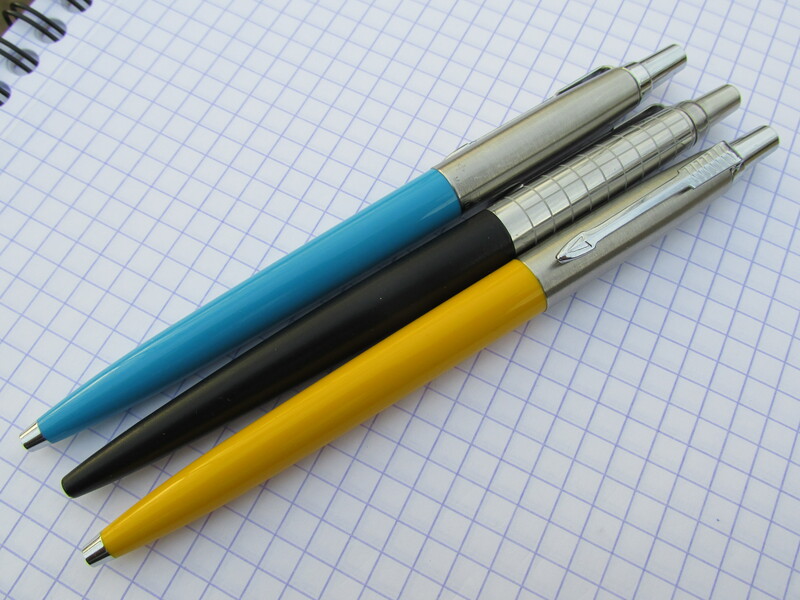 First, my go-to-non-fountain-pen-of-choice, the Pentel Energels. I’m happy to say that the Energels took to the stone paper like a fish to water. This was especially true of the wider 0.7 mm point. 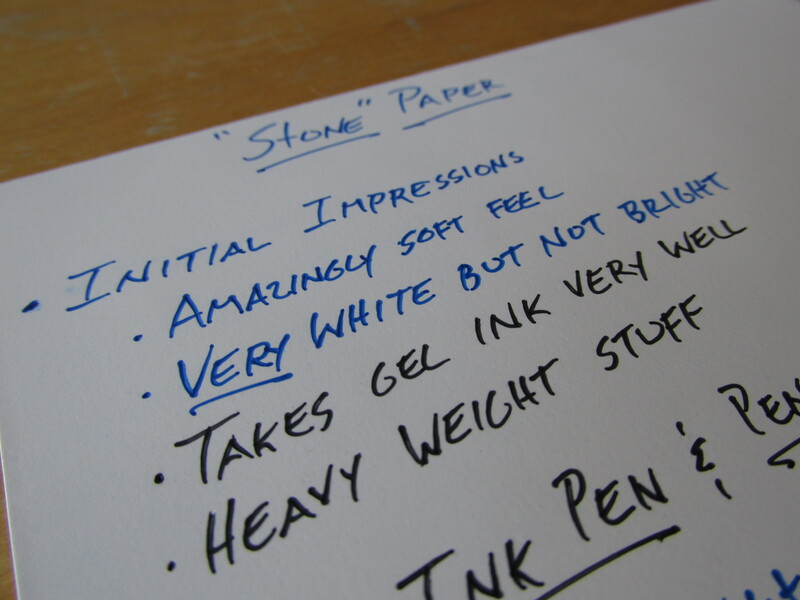 In my experience, Energels write well on most paper surfaces but they felt particularly smooth on the stone paper and laid down a solid and consistent line. Unfortunately, the dry times for the Energels on the stone paper were less than ideal. 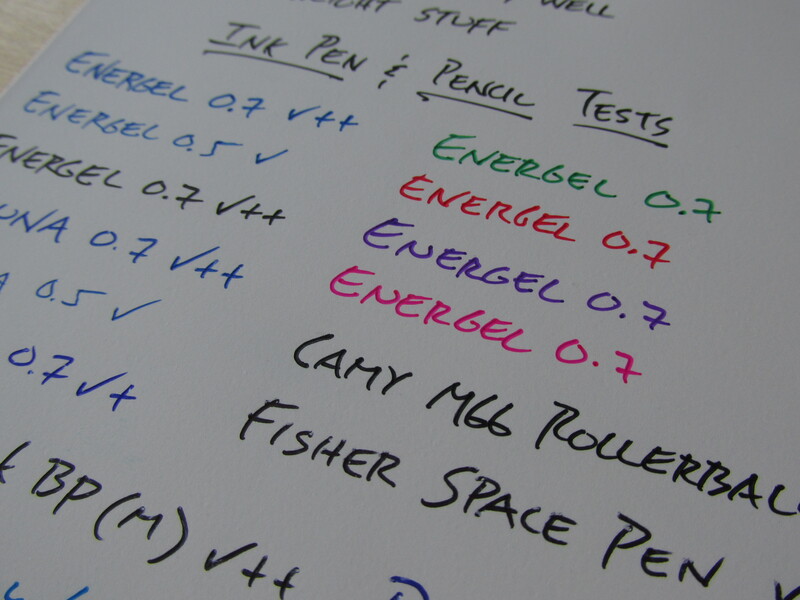 Energels are, in my experience, the fastest drying gels pens on the market today but something about the gel chemicals and the stone paper inhibits drying times. Regardless, there is smearing evident, even at the 10 second mark. That said, the writing experience is so smooth with the gel/stone paper combination that I might be willing to take my time writing and enjoy the ride. 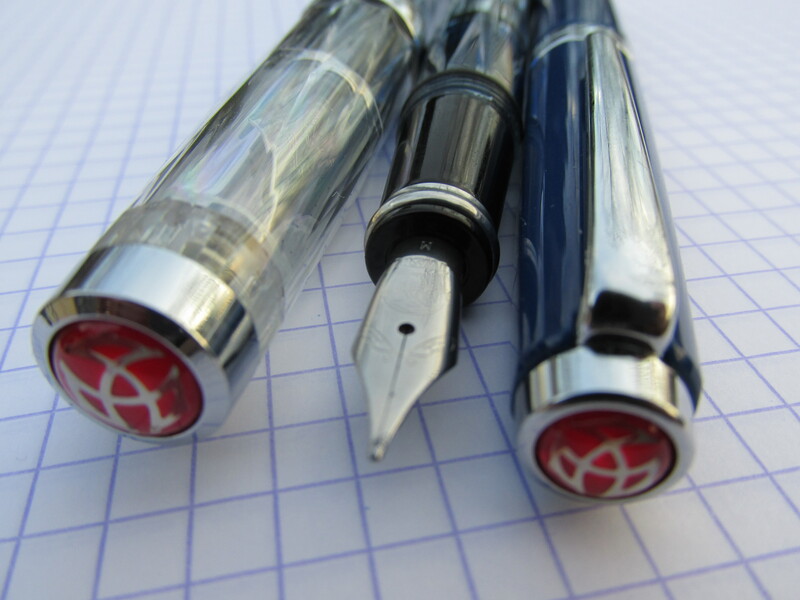 What about fountain pens? Well, the few that I tried did not fare particularly well. 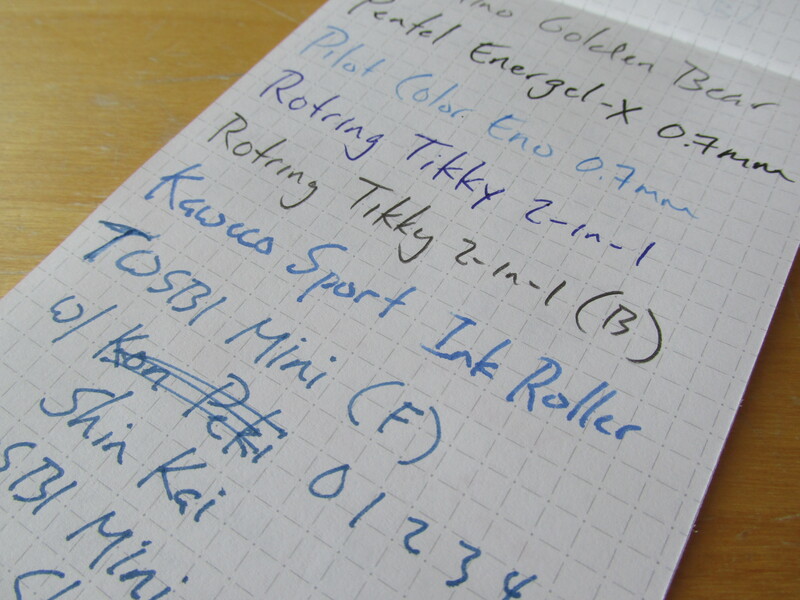 My fine nib Kaweco AL Sport with Kaweco Blue did reasonably well. The writing was smooth but there was a touch of feathering on a letter or two. 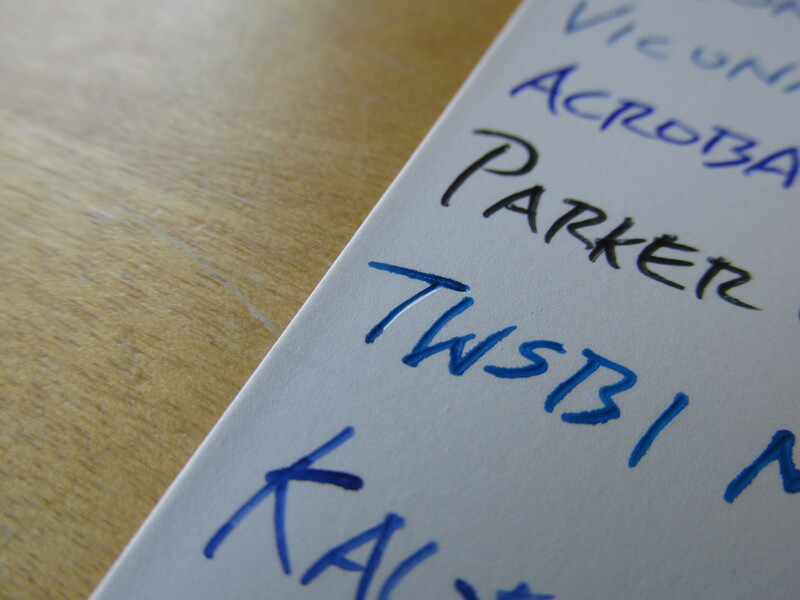 My TWSBI Mini, also with a fine nib and sporting Kon Peki, was less successful as the sharper point of the TWSBI dug into the stone paper a bit. You can see the digging in with the “T” of TWSBI in the pictures below. 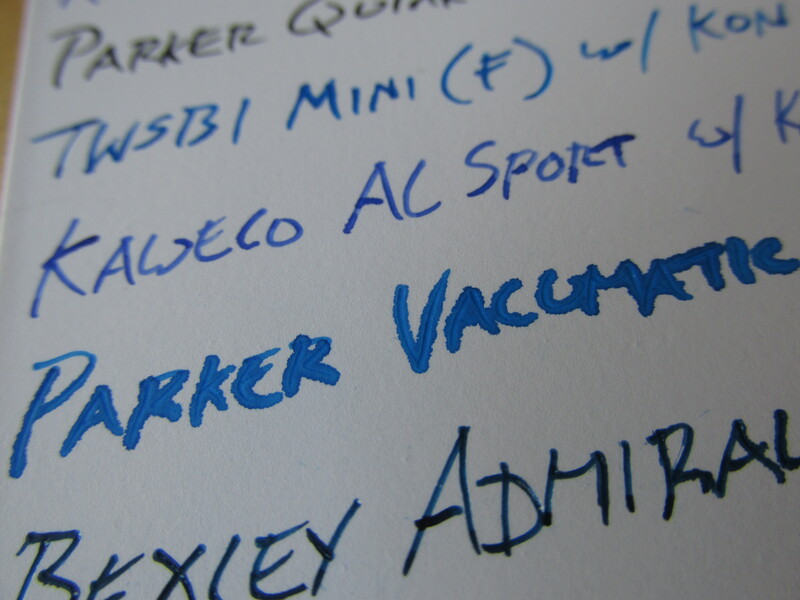 My Parker Vacumatic (also fine, also Kon Peki) was the one epic fail of the lot. All in all, I think good results could be obtained with a rounded fine nib and less slippery inks, but I did not immediately find a fountain pen/ink combination that worked like a charm with the stone paper. 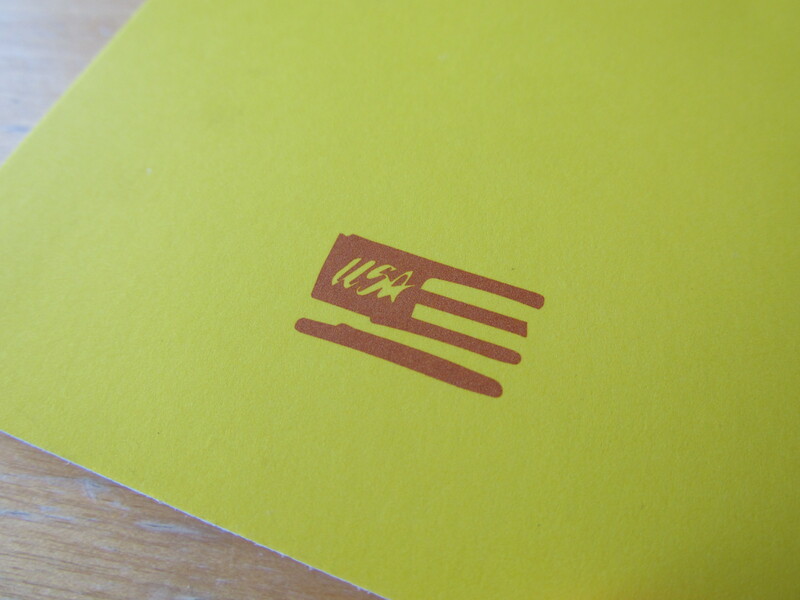 Let me finish with the pen/ink combinations that took to the stone paper best. Hybrid and ballpoint inks did very, very well on this paper. Color saturation was amazing (on par with gel inks) and the dry times were nearly instantaneous. 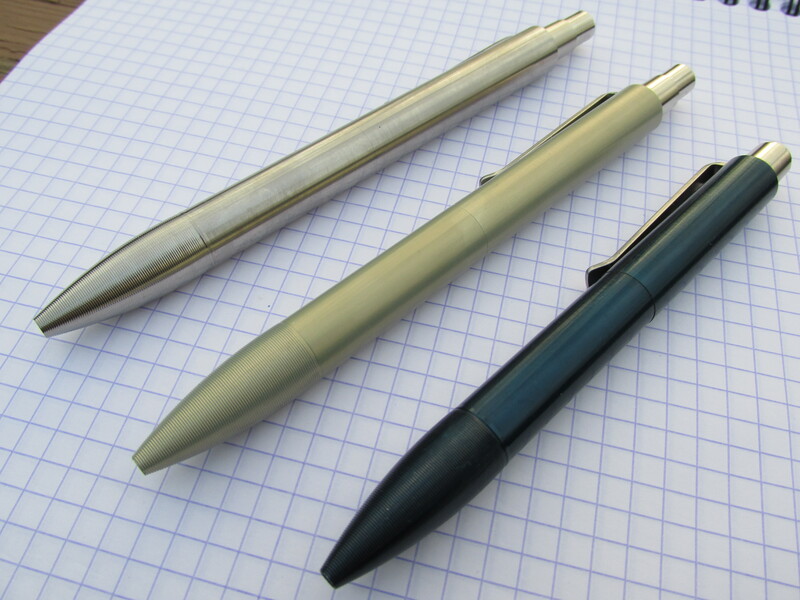 I think I can use a touch of chemistry to explain why the ballpoints worked so well. Apparently, the stone paper is made with 80% calcium carbonate and 20% non-toxic resin (I’m guessing these are weight percentages). 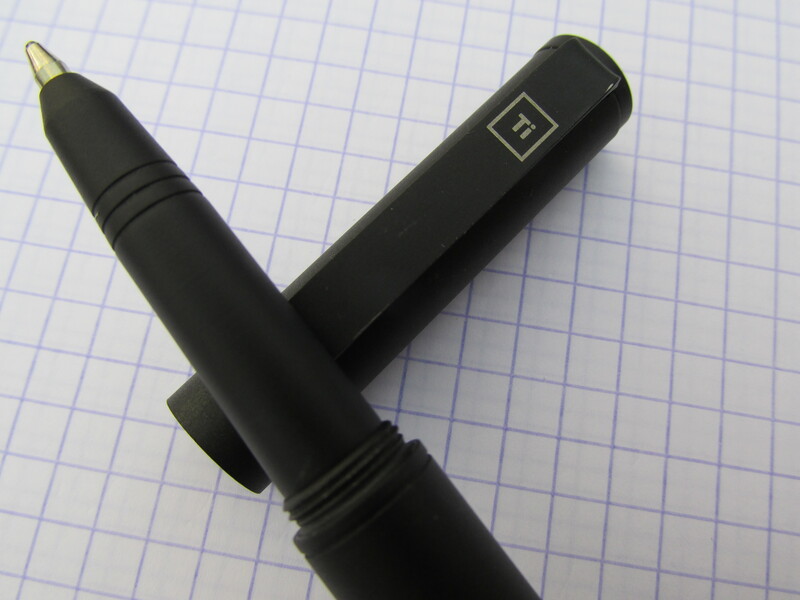 Ballpoint and, to a less extent, hybrid inks are oil-based (i.e. hydrocarbon) media which I suspect bind effectively with the resin (i.e. hydrocarbon) of the stone paper. 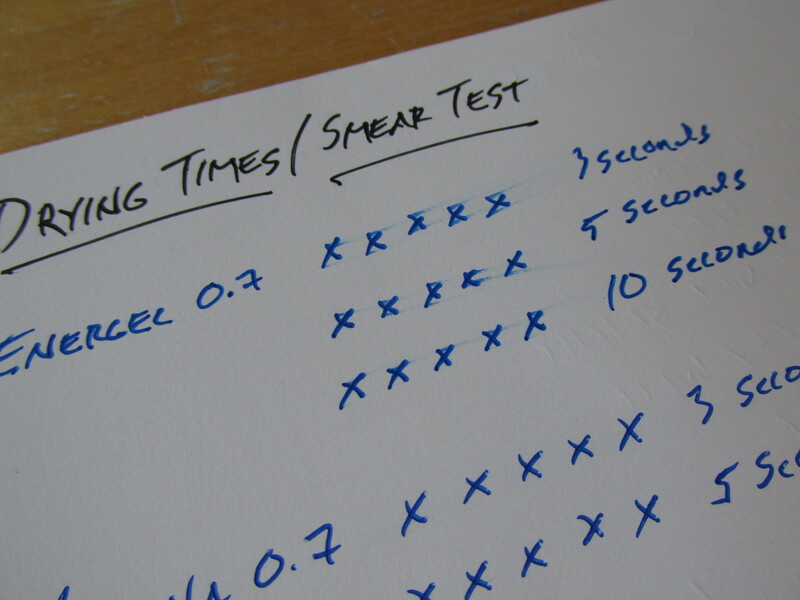 Interestingly, my Lamy rollerball (water-based ink) also wrote nicely and dried quickly on the stone paper but a post-writing water test showed some differences. The water-based rollerball ink and the gel inks smeared noticeably after dabbing with water but the hybrid and ballpoint inks held up great. For what it’s worth, I also used some pencils on the stone paper. Very sharp and hard points dug into the paper too much, but softer/wider leads wrote smoothly. 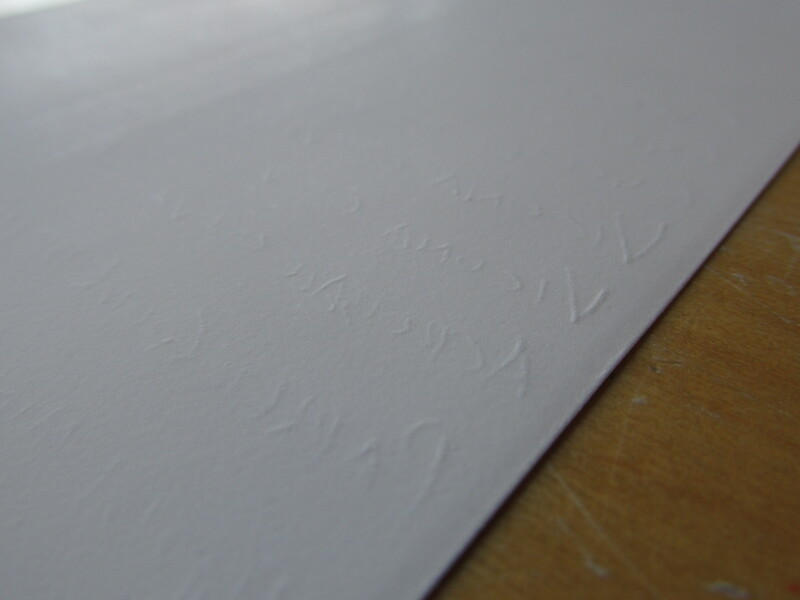 You can see the evidence of digging into the paper by the bits of embossing on the back. Let’s conclude. Fountain pens and inks? Probably not. Gel pens and inks? Yes, but take your time to avoid smearing. Rollerball inks? Yes (but avoid water as always with rollerball inks). Ballpoint and hybrid inks? Yes, absolutely, my goodness yes! In fact, I decided to back the Kickstarter project for the Da Vinci Notebook based solely on the positive results I saw with ballpoint and hybrid inks. 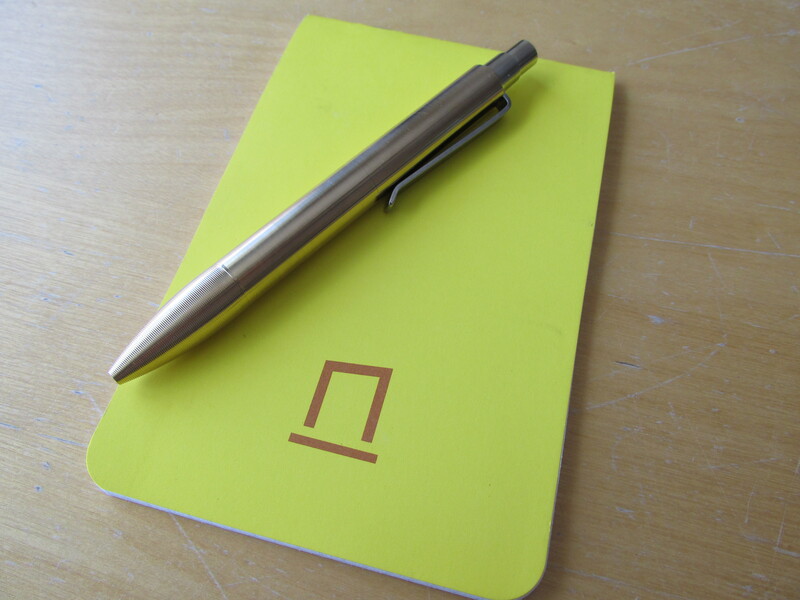 Backer options start at $12 on Kickstarter so trying the notebook for yourself won’t cost too much. On a related note, Oxford makes a stone paper notebook that is available from Walgreens of all places (Sorry, I can’t bring myself to put a link to Walgreens on my blog). After playing with the Da Vinci Notebook paper sample, I ran over to my local Walgreens and got lucky. The paper in the Oxford book does have a similar texture and also provides a smooth writing feel. However, the Oxford paper is noticeably thinner than the Da Vinci Notebook sample. In fact, the page beneath the current page does become slightly embossed from writing in the Oxford notebook. I’m happy to have the Oxford notebook to play around with more stone paper, but I’m hopeful that the Kickstarter Da Vinci Notebooks will be a clear step up in quality. A sample of the stone paper was provided to me free of charge by the creator of the Da Vinci Notebook Kickstarter project. Opinions and perspectives are entirely my own.